Welcome to Broome. 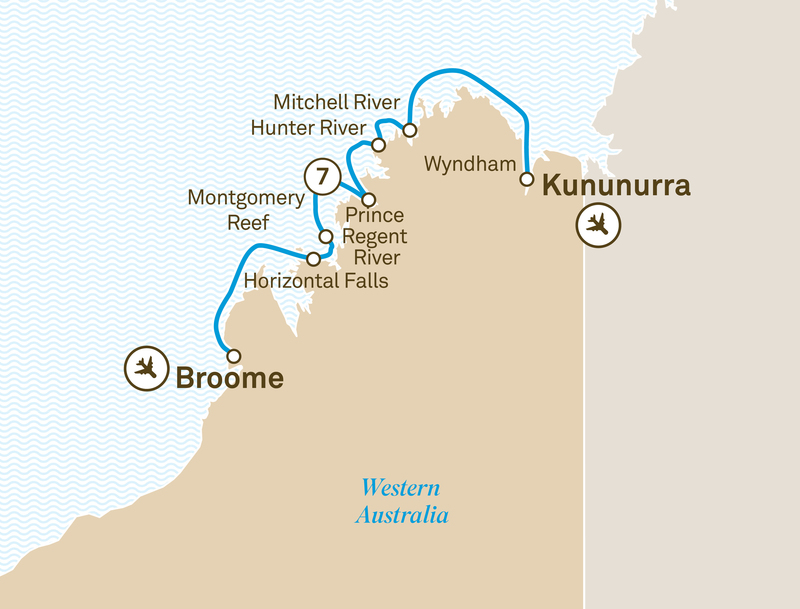 This afternoon, board your True North Kimberley Snapshot cruise. for a different view of the falls. (Additional expense). Explore the Sale River, fish for Barra then join naturalists and ‘ride the tide’ on a classic river expedition. Later, cruise to Montgomery Reef where 140 square miles of coral reef rise out of the ocean. Water cascades from the reef as the tide falls, exposing a privileged glimpse of another world. Turtles, dugong, manta rays and every imaginable sea creature abound. The scenery will astound as you enter the Prince Regent River. At Kings Cascades, your crew will manoeuvre the True North right under the majestic falls. Go on an ‘adventure in the tender’ and take a swim in yet another picture perfect billabong. With red cliffs set against rainforest and mangroves, the Hunter River is a stunning setting for fishing, mud crabbing, bird watching and just simply exploring. Enjoy an exhilarating hike to Jackson Falls and, if time permits, enjoy a sunset drink on Naturaliste Island before an overnight cruise to Vansittart Bay. Today there will be an opportunity to see the ‘Bradshaws’, reputed to be the oldest art known to man. An optional heli-picnic at Eagle Falls includes a sumptuous picnic lunch amidst breathtaking scenery. (Additional expense). The tenders will be busy exploring beaches and creeks before an overnight cruise to Koolama Bay. Cross the sand bars at the mouth of the mighty King George River to reveal even more breathtaking vistas as you journey upstream to the King George Falls. Anchored at the base of Twin Falls, you will find endless places to explore. Climb to the top of the falls for a cruise highlight. Learn about the bombing of a state-ship during WWII, then take a stroll around Tranquil Bay before continuing to the frontier port of Wyndham. After a fond farewell from your True North crew, travel by coach to Kununurra before you head home with many wonderful memories.